What are the Fastest ways to Bind Presentations? The fastest way to bind presentations is going to depend on the kind of finished look you want for your presentation. So I have put together a list of the 5 fastest ways to bind pages together, along with photos, so you can pick and choose which ones will work best for the kinds of presentation you want to make. • Pinchbook Hard Covers - With these cool hard covers you can make presentations in 5 seconds, flat, and with no machine. Open the covers past the halfway point, slide in your pages, and close the covers -- and you're done! • Binding Rings - Quick snap open and snap shut loose leaf binder rings are a very fast and easy to bind in just a few seconds. Use one book ring on the corner of your presentation, three along the edge, two along the top, or any other number of configurations. • Screw Posts - Chicago binding posts are another quick way to bind documents together; just screw the two ends together through your punched hole for a bound document that is ready in just a few seconds. Easily edit them by unscrewing to add or remove pages to your Chicaco screws just as fast. • Thermal Binding Machines - With a thermal binding machine paired with a thermal binding cover, you can make as many as 2 documents per second (depending on the machine). Hard and soft covers are available, so you can get any finished look you want. • Tape Binding Machines - A tape binding machine can make documents 3 times faster than traditional punch-and-binding machines. It quickly applies a colored fabric tape strip along and around the a binding edge for a clean and flat presentation. All of these fast ways to bind documents are very versatile. They can be used for a huge variety of applications and presentation types. 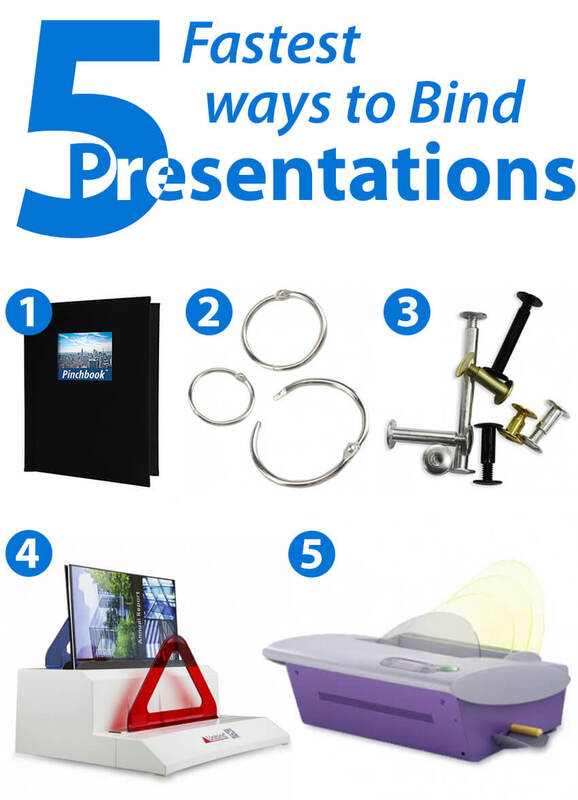 Some of our most popular uses for these quick ways to bind include business presentations, such as financial reports to present to your board of directors, and client presentations in the form of proposals or quotes.